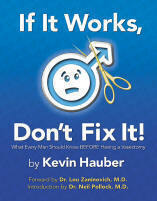 Kevin Hauber's If It Works, Don't Fix It! ?In writing this book, Kevin has put a human face to the ?rare post-vasectomy problems? and he has put a big question mark to the quoted statistics about complications from the procedure. My experience correlates with Kevin?s conclusions that these problems are not so rare as some surgeons want to believe. I commend Kevin?s book to you. ?As recently as a couple of weeks ago, a man came to see me for my opinion on a vasectomy. I strongly advised him not to have one and quoted possible complications. He obviously got a much more optimistic picture from his surgeon, certainly enough assurance to negate my warnings, and he has gone ahead with the operation. ?Such is what we are up against.? ?Kevin Hauber?s odyssey of suffering after having a vasectomy reinforces the concern repeatedly expressed in my publications over the last quarter century about the potential severe consequences stemming from failure of men to receive proper informed consent about the risks. In view of the magnitude of vasectomania, it would be a disservice for physicians and public health officials to ignore his experience and that of many others on the grounds they are ?just anecdotes?.? Dr. H. J. Roberts, FACP, Author of Is Vasectomy Worth the Risk? A Physician?s Case Against Vasectomania (1993) and Is Vasectomy Safe? Medical, Public Health and Legal Implications (1979). ?I know many men will benefit from reading this book.... Kevin writes from his own experience with great clarity, humor, and a growing respect for the awesome complexity of our human bodies.... Kevin...transforms tragedy into a bright shining light by illuminating a subject which has been kept quiet for so very long.? Dr. Diane L. Stern, M.D. The first edition of If It Works, Don't Fix It! What Every Man Should Know BEFORE Having A Vasectomy is available in print directly from the publisher, Infinity Publishing (aka "Buy Books on the web"). Books ship within a few days. order a hard copy of the book. By popular demand, the second edition of the book is now available exclusively as a PDF file, which you can conveniently purchase and download right now. This version features full-color photographs. To ensure that your transaction goes as smoothly and as easily as intended, please take a moment to carefully read all of the information below before proceeding. The downloadable file is nearly 13 MB, so a broadband Internet connection is recommended (although not required). You must have the free Adobe Reader in order to view/print the file (version 6 or later is required). You're encouraged to install the new Adobe Reader 7, if you don't already have it. Payments are processed securely by PayPal. Please note that if you don't already have or for some reason you don't want a PayPal account, you will not be required to create one for this purchase (it's strictly optional). VERY IMPORTANT: Once you've successfully submitted your payment via PayPal, you will see a page that says, "You Have Completed Your Transaction!" Be sure to print a copy of that page or at least make a record of your receipt ID. At the bottom of the page, you will see a button that says, "Return to Merchant" (see illustration below). You MUST click on that button to be returned to the page where you will download the book (PDF). downloading procedure, please click here for support via e-mail.